Ronald E. Osborn. 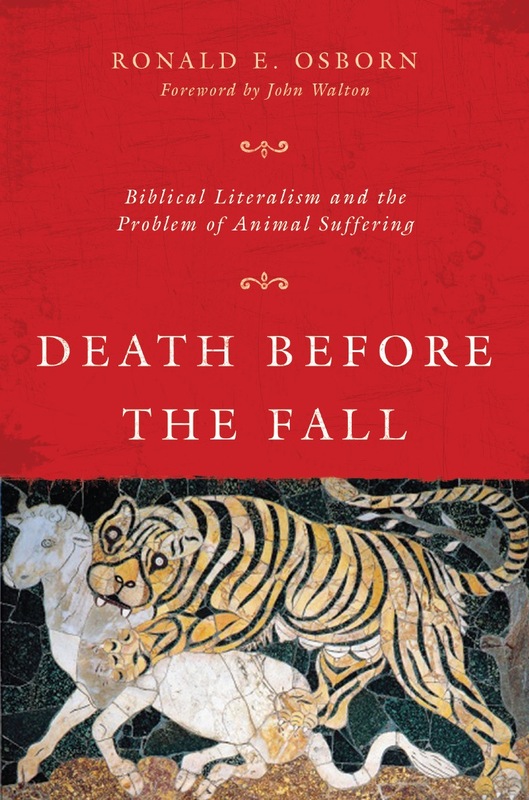 Death Before the Fall: Biblical Literalism and the Problem of Animal Suffering. Downers Grove, IL: InterVarsity Press, 2014. 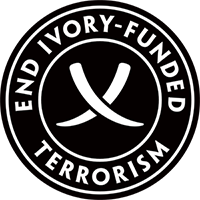 Osborn sees his book as providing a contribution to this problem (20). And after the introduction I was anxious to learn more of his proposed solutions. Unfortunately, this is the point where I observe that you can’t judge this book by its cover (or its introduction). At this point we begin Part 1 which extends for 100 pages and which only touches at a few fleeting points on the “central riddle” so tantalizingly presented in the introduction. Instead, Part 1 consists of nine chapters that cover a bewildering number of topics including hermeneutics, fundamentalism, philosophy of science, and epistemology. Osborn does eventually get around to the central riddle in part 2 (the book’s final fifty pages). I might have been able to forgive the fact that less than 1/3 of the book deals with the stated theme if Part 1 clearly provided a cumulative argument that laid a necessary foundation for the treatment of animal suffering and evil in part 2. So let me propose a far more accurate title for this book: Polemical Musings on Fundamentalism, Science, Creation, and the Problem of Animal Suffering. I suspect I would have been a good deal happier with the book had it been marketed more in keeping with the content. With that in mind, in the remainder of the review I’ll make some observations about the book’s polemical tone and the general quality of its reflections (or musings) before turning to assess Osborn’s contributions to that central riddle which come in part 2. I want to pause on this passage as an illustration of this type of analysis. We can start with the strategically vague qualifier “many”. No doubt “many” literalists live in visceral terror just like “many” liberals disavow the free market and “many” atheists really hate God and “many” pre-teen girls are devoted Beliebers. Once you offer a suitably vague qualifier, one can engage in all sorts of speculative psychoanalysis that effectively tarnishes an entire group including those in the group who do not conform (because they don’t love Justin Bieber or hate God, or disavow the free market or live with a visceral terror). I will grant Osborn this much: he is effective at lampooning pained fundamentalist attempts to defend flat “literal” readings of various biblical passages. Consider Leonard Brand from the “Geo-Science Research Institute” who suggests that God could have created the illusion of an extended day (recorded in Joshua 10:13) by using a system of giant mirrors (70). You don’t even have to satirize an argument like that. You just have to cite it and stand back. Osborn is most effective at this parts of the book where he draws out the absurdity of fundamentalist positions. But I was left dissatisfied with his penchant for speculative armchair psychoanalysis and sweeping polemical broadsides against his fundamentalist foes. If one really wants to understand fundamentalist views of biblical authority, inspiration and interpretation, one is better off reading the more sober and academic analysis of historians like George Marsden and Mark Noll. I suggested including “Musings” in the title because the book reads more like a collection of self-contained literary units connected to the wider whole with only a thin thread (consider the extended discussion of philosophy of science in chapter four and Gnosticism in chapter seven). In other words, the book reads like it originated as several independent literary units and one question: “How can I fit all these articles into a single book?” This impression is confirmed early on when Osborn notes that the book grew out of a series of online magazine articles published in 2010-2011 (18). As you are no doubt aware, magazine articles are not the place for rigorous depth, and so it is here. Osborn has many interesting thoughts spanning a wide range of disciplines, but rarely does he engage in depth with the academic literature on a topic. This is disappointing for those looking for more rigor and systematic consistency. But even worse, it sometimes gets Osborn into trouble. For example, he talks frequently of “foundationalism”. But he shows no real awareness as to how the concept of foundationalism is understood in contemporary epistemology. Instead, he seems to get his understanding from Nancey Murphy. (His analysis also calls to mind F. LeRon Shults and J. Wentzel van Huyssteen.) Unfortunately, this results in a strawman in which foundationalism is conflated with a type of Cartesian strong foundationalism, and which allows Osborn to offer a “postfoundationalist” coherentism in its place. Alas, Osborn shows no real grasp of concepts like “noetic structure”, “epistemic justification” and “proper basicality”. And this renders his entire epistemological analysis little more than a misleading distraction that detracts from the overall value of the work. What then of animal suffering? 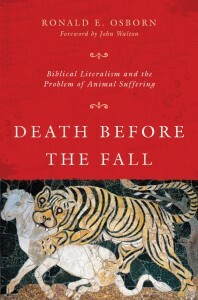 This book purports to be about animal suffering. So what does Osborn have to say about that problem when he finally gets there in part 2? In keeping with the style of the book, these final five chapters offer five separate treatments of the topic including three literalist dilemmas (chapter 10), a vague Lewisean reading of natural evil in midrashic terms (chapter 11), a reflection on the Book of Job and its embrace of predatory animals as part of God’s good creation (chapter 12) a theology of creation as kenosis (chapter 13) and a reflection on Sabbath rest with only a tenuous relationship to the topic of animal suffering (chapter 14). There is definitely some interesting material here, though frustratingly much of it is of a cursory nature. And since these are just reflections, Osborn avoids going any deeper into a systematic explanation. A cynic might retort that just as two half-baked loaves don’t add up to a single edible loaf, so a collocation of half-baked ideas doesn’t add up to a satisfactory treatment of evil. But then Osborn does warn us at the beginning that he offers “few confident answers” (20) to the problem. Thus, his real goal is “to provoke honest even if unsettling conversations” (20) about the problem. I’d say that part 2 does succeed to some degree in that regard. However, I think small group discussion questions after every chapter would have been a valuable addition to furthering those conversations. At the same time, I can’t help but feel that to a certain degree Osborn’s indecisive approach is not as much a sign of intellectual courage and rigor as a failure to follow through any of the ideas he explores in cursory form with greater rigor and attention. It certainly would be good to have some more decisive replies than he provides. For example, his discussion of creation as kenosis is frustratingly vague and lapses into poetry precisely when analytical precision is to be expected. Osborn writes: “the creation is best seen as an improvisational theater or musical performance in which the director invites the actors–and not human actors alone–to join in the writing of the script, with all of the danger and all of the possibility that this implies.” (162) The language of “danger” and “possibility” is language that calls to mind open theism. So is Osborn endorsing open theism as a solution? He never says. As for the “actor” metaphor, if one must be an agent to be an actor, then there are no non-human actors. If, however, a rock rolling down a hill constitutes an actor then the metaphor is potentially pushed beyond the breaking point. Whether the metaphor is a defensible heuristic is never really explored. Many people reading a review are looking for a simple, decisive analysis: good or bad? Thumbs up or thumbs down? I can’t offer such an analysis here. Instead, my assessment must be adjusted to expectations. 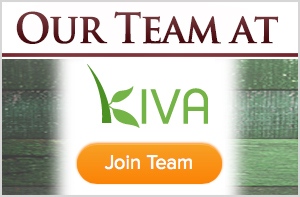 If one is looking for a rigorous, focused treatment of the problem of animal suffering, they won’t find it here. Instead, I would direct those interested to read Christopher Southgate’s The Groaning of Creation: God, Evolution, and the Problem of Evil or Michael Murray’s Nature Red in Tooth and Claw: Theism and the Problem of Animal Suffering. One should also check out Trent Dougherty’s forthcoming book The Problem of Animal Pain: A Theodicy For All Creatures Great And Small. Dougherty is a great younger philosopher with some really interesting ideas on animal pain and compensatory resurrection. However, if one is looking for a lively collection of polemical musings on topics like fundamentalism, hermeneutics, science, creation, Genesis 1-3, and the problem of animal suffering, then this will be a valuable addition to your library. Thanks to InterVarsity Press for a review copy of the book.